(NaturalNews) McClatchy is now reporting that Obamacare premiums are skyrocketing another 25% in 2017, thrusting health insurance premiums into the stratosphere. With the American middle class now being devastated by rising health insurance premiums and Obamacare's confiscatory tax penalties for non-compliance, traumatized Americans are screaming, "ENOUGH!" 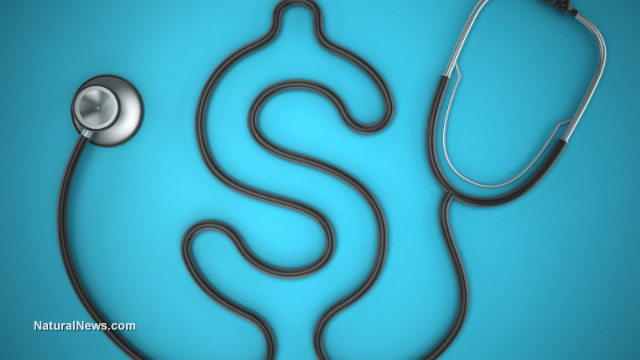 "Insurers are raising the 2017 premiums for a popular and significant group of health plans sold through HealthCare.gov by an average of 25 percent, more than triple the increase for this year, according to new government figures," says the article. When premiums rise by 25% each year, they will more than double in just three years (do the math, it's true). Even without the 2017 increases, Obamacare is unaffordable to almost anyone who works for a living. It's only the low-wage workers across America who can afford Obamacare, and that's only because their costs are being overwhelmingly subsidizes by taxpayers. As rising health insurance rates lead to massive job losses, slashing of work hours, offshoring of workers and a loss of business competitiveness for U.S. companies, the middle class is being economically decimated. Some families are now paying more than $25,000 a year in health insurance premiums, and in three more years under a Clinton presidency, that rate will likely double to $50,000 a year. How can "health care" costs skyrocket so much? Because Obamacare is nothing but a massive government racket to transfer the wealth of the working class to the pockets of the pharmaceutical giants. It's a scam. Like everything else you witness today in government and the media, it's all rigged from the start. The health care system was never designed to keep you healthy. It was actually designed to extract the maximum financial wealth from the population and concentrate it into the pockets of the ultra wealthy corporatists who run the corrupt government. That's why "health care" doesn't promote health... and the people who run it don't even care. That's also why Obamacare can never be solved by tweaking it. To save America from the financial and medical devastation now looming over the entire nation, we must excise Obamacare from this nation like a festering cancer tumor. We must cut it out, burn it out, or do anything and everything necessary to repeal and replace this failed, fraudulent system of really bad ideas coming out of the clueless morons in Washington D.C... people who have no idea whatsoever how the real world works (because they're never lived in it). I actually have a system that can fix America's failed Obamacare nightmare. Yes, I have a simple, market-based approach to fixing health care that's smarter than all of Obama's economic advisors combined. It would vastly reduce health care costs, instantaneously improve patient outcomes, and drive intense competition between health care providers, finally forcing them to treat patients like valuable customers rather than medical slaves. My system is based on a combination of health care vouchers, online surveying of patient outcomes, total transparency of health care pricing, and a complete overhaul of what's covered so that truly preventive services such as chiropractic care, massage therapy, acupuncture, fitness gym memberships, nutritional supplements and holistic medicine are covered under "prevention." Fixing the broken health care system isn't difficult. First, you have to actually want the system to work -- which is something the democrats never really desired. You also have to end the Big Pharma monopoly, completely gut the FDA, end the collusion between government regulators and pharmaceutical interests, and start making mass arrests of pharmaceutical company CEOs who poison children for profit. Once Trump wins the White House, if he's interested I'll be happy to fly to Washington D.C. and lay out the plan that can save America through radical health care reforms. The drug companies will lose big, but the People will WIN big! If you want pioneering problem solvers like myself to have any influence in Washington, we must first change the people running Washington. Hillary Clinton is just an extension of the failed policies of Obama. She's a Big Pharma hack, a vaccine pusher, a Monsanto operative and a truly evil individual with no regard whatsoever for innocent human life. If Hillary Clinton steals the White House in this upcoming election, your health care coverage will get even more expensive in the years ahead, even as the FDA criminalizes natural cancer treatments and dietary supplements that can affordably and safely prevent disease (like vitamin D, which can prevent cancer for mere pennies a day). That's why this November 8th, your only sane choice is to vote for Donald J. Trump as a vote against the crooked, corrupt establishment. If you want to end the medical industry's stranglehold on America, you must throw the corrupt plutocrats out of office... starting with Hillary Rotten Clinton. In their place, we need smart, tough-minded business pioneers, independent medical experts and honest scientists who aren't beholden to the system. Frankly, we need people like myself, Ocean Robbins, Suzanne Somers (in cooperation with the Gonzalez practice in New York) and Sayer Ji to reveal to this nation how to prevent disease, clean up the food supply and start saving billions of dollars by preventing cancer for pennies instead of "treating" it for millions of dollars. Remember: We are not going to solve this nation's health care problems with the same kind of thinking that got us into this mess in the first place. Or as I'm fond of saying, no nation can ever afford the rising costs associated with caring for an increasingly diseased population. If you want to control health care costs, you have to STOP the causes of disease. It's economics 101. Treating disease is highly lucrative for drug companies, hospitals and doctors, but it's economic suicide for the nation as a whole. Anybody who wants to solve America's health care crisis should reject Obamacare, reject Hillary Clinton and start turning to revolutionary thinkers who understand the causes of disease and how to prevent those diseases for pennies a day. STEP ONE: Elect Donald Trump. In just four years, I can slash health care costs in America by fifty percent while vastly improving patient outcomes in the process. It's not rocket science. You just have to prioritize human health over corporate profits. Sadly, there isn't a single person in the corrupt system of government currently occupying Washington D.C. who isn't already sold out to the fascist corporate system that runs our "sick care" system today. For America to regain its health, that system must be stamped out for good. It's time to stop letting powerful corporations PROFIT from sickness and disease. It's time to legalize natural medicine, legalize honest marketing claims for dietary supplements, and end the tyranny of the FDA once and for all.